Congratulations to our U13 and U15 youngsters for excelling at the Manchester United / Flow Skills Clinic! 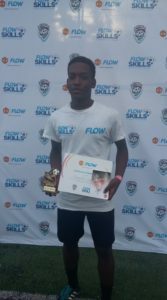 Ronaldo “Naldo” Clarke was awarded the winner for 14 – 16 age group, while Kevaughn “Socca” Wilson got runner-up to former HVFC FirstKick player, Brian Burkitt, in the 12 – 13 age group. 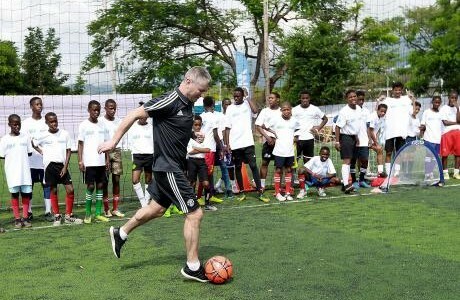 Former Manchester United defender Denis Irwin said that he was very impressed with the skill levels and technical ability that were on display at the staging of the FLOW Skills Ultimate Football Experience Challenge, which was held at Ballaz, Liberty Park. More than 100 of the country’s top young footballers, ages 12-16, from local football clubs and schools, competed in challenges that tested their skills in short passing, dribbling, defensive qualities, teamwork, attitude, and goalscoring. The skills are all taken from the Manchester United Soccer Schools’ programme. “I am really surprised how good a shape all the boys and girls are in. The skill levels are very high, and so that’s really good,” said Irwin, who represented Manchester United from 1990-2002. “I know that Jamaica is a cricket country and not a big football country, and so it is good to see at first hand the talent that is here,” he said. The Northern Ireland-born Irwin added that the youngsters should work hard, stay focused, and chase their dreams of becoming professional footballers. “I go back 35-years when I was their age, and I grew up in a country where football wasn’t the number-one sport there, but you have a dream, and my dream was to play in the Premier League, for anybody really, but obviously, it was better at Manchester United,” Irwin said. Brian Burkett from St George’s College and HVFC’s Ronaldo Clarke of Camperdown were champions of the challenge. Burkett won the 12-13 category where HVFC’s Kevaughn Wilson came 2nd, while Clarke took the 14-16 section. These two players, along with their coaches and a parent, will now travel to Trinidad and Tobago, where they will compete in a final weekend of skills and small-side games. The players will also compete with the finalists from 14 countries for the chance to be one of two players to win a once-in-a-lifetime VIP trip to Old Trafford in Manchester, England. 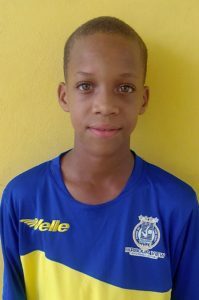 Last season our U14 player, striker Tyrese Williams, was one of two players selected to represent Jamaica and the Caribbean in Trinidad and Tobago, alongside Coach Dwayne Blake and his Dad.